← Frequently Asked Questions: What is degenerative disk disease? Frequently Asked Questions: What is sciatica? In the low back, nerves join to form the sciatic nerve, which runs down into the leg and controls the leg muscles. Sciatica is the descriptive term for when pain runs from your back or buttocks down your leg and even into your foot. 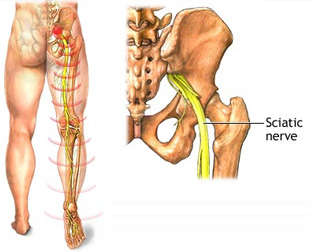 It is a condition caused by either compression or trauma of the sciatic nerve. Sciatica is made worse when you cough or if someone lifts your leg up while you are lying down. Symptoms may begin abruptly or gradually, are usually irritated by movement, and often grow worse at night. Sciatica implies that there is an irritation of your nerve root in the lower part of your spine. In some instances, this could be due to a ruptured or herniated disc in your lower back.